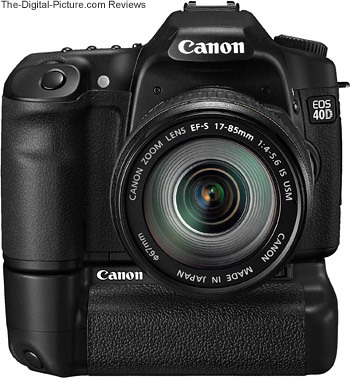 Note: The Canon EOS 40D has been replaced by the Canon EOS 50D. Almost immediately upon the announcement of the Canon 40D, the most-frequently asked question I have been receiving since the announcement of the Canon EOS 400D/Rebel XTi one year ago nearly disappeared from my inbox. Until this time, the lower end Canon DSLR had a couple of desirable feature advantages over the 40D's predecessor, the Canon EOS 30D. Now, aside from size (which may or may not be an advantage), weight and cost, the 40D is clearly the better camera in this comparison. The 40D's very long list new/improved features makes this camera a very nice upgrade over the XTi, the 30D and their predecessors. Though most people are not going to find any one new or improved feature compelling enough to justify an upgrade from the 30D, combine all of these features and the 40D begins looking very attractive. There are a lot of 20D owners who sat out the 30D upgrade cycle who will give serious consideration to bringing a 40D home. The 30D set the bar high. It is an all-around great camera that delivers the great image quality Canon is legendary for. The Canon EOS 40D announcement was one of the most-anticipated Canon EOS announcements ever. We had high hopes for the 30D's upgrade. When reading the announcement, I was quickly let down/disappointed to hear that the XTi/400D's sensor was the basis for Canon's new-at-this-time camera. Not that the XTi/400D sensor is bad - it is very good - 10.1 megapixels is a very high resolution image - this is plenty of detail for most uses. I was just hoping for a more radical upgrade. I quickly took heart when I learned that improved microlenses were positioned over this sensor - and that 14 bit capture had been implemented - along with the expected DIGIC III processor. With the same sensor density, the 40D resolves detail very similarly to the XTi/400D - and better than the 30D. These are the results I expected. You can visually compare the resolution difference using the ISO 12233 Resolution Chart crop sample comparison tool. This comparison was shot using the Canon EF 200mm f/2.8 L II USM Lens - I suggest using an f/4 aperture for comparing, but most below f/8 will work fine. Several other DSLR results are available for this lens, so other comparisons can be made as well. In real life shots, the difference between 8 and 10 megapixel images is not big. The extra image detail is always welcomed, but will not be a sole reason for most people to upgrade from a 20D or 30D. To reach this resolution in an APS-C sized (1.6x FOVCF) sensor, the XTi/400D and 40D sensors are required to be the most-dense of any found in a Canon DSLR body to this date. As sensor size decreases, pixel-level image quality often decreases as there is less light reaching each individual pixel well. 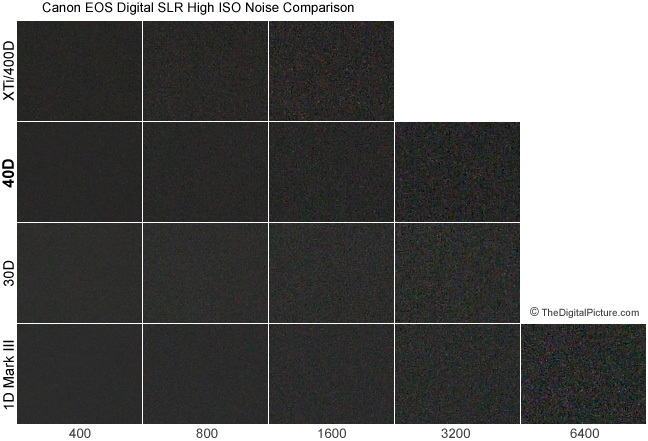 The visible difference is often in the form of noise - especially high ISO noise. We saw this in the XTi/400D compared to the 30D. The good news is, the 40D essentially matches the 30D's low noise capabilities. The process of determining this was not exactly straight forward as I've determined that the 40D's sensor is about 1/6 to 1/3 of a stop less sensitive than the 30D's. This means that images shot with identical shooting parameters (shutter speed, aperture & ISO) are not exposed exactly the same. I should note here that the 40D's metering is fine - this change does not cause underexposed images. In my eyes, the 40D noise is equal to the 30D right up through ISO 3200 when identical shooting parameters are used. I'd rate the 40D slightly better at ISO 800. But, after making the exposures identical (+1/6 EV on the 40D), the 30D has a slight edge at ISO 1600 and 3200 - and the two are about even at ISO 800. The above 100% sample crops were taken under controlled conditions using a Westcott Spiderlite TD5 with 5000k fluorescent bulbs and a softbox. Identical exposures were manually set - 1/30 and f/8 were the ISO 400 settings. The shutter speed was halved for each 1 stop increase in ISO setting. Auto white balance and neutral Picture Styles were selected and sharpness was set to "1" - a light but normal real world setting (noise gets sharpened). All images were shot as RAW files, no noise reduction was used. The RAW files were processed to 16-bit TIFF files, imported into Photoshop and output as a JPG using "Save For Web" at a quality setting of 80. The above shots (100% crops) were taken with a tripod-mounted Canon EF 180mm f/3.5 L Macro USM Lens with available noise reduction turned off. I mention tipod-mounted not because this is a detail/sharpness test (the above crops were not taken from the focus point of the shot - and don't confuse noise with sharpness) but to explain the subject size differences. The size of the subject in each image block is due to the sensor density of the camera used - The lens was not moved between camera changes. You are looking at the back window of a BMW - with a headrest inside and another SUV's mirror on the other side. All were shot with identical exposures (you can see the slightly lower sensitivity of the 40D sensor) on a clear day. Increase the 40D exposure to match the 30D's and the noise results will look similar to each other. Still quite good. 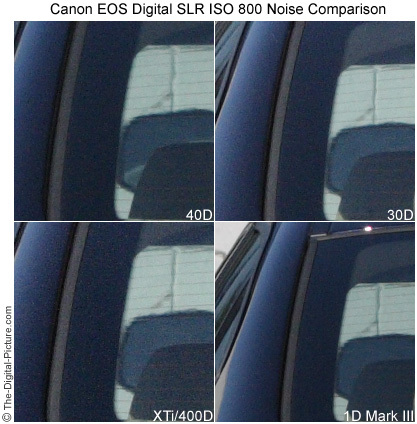 The 1D Mark III shines in this comparison - as it usually does. The 40D's RAW files now contain 14-bit images which store 16,384 colors per channel (vs 4,096). Finer color definition should result in improved tonal gradation or color transitions. When I'm post-processing RAW files for later use in Photoshop, I nearly always output to 16-bit TIFF files (which actually contain 12-bit images prior to the 40D and the 1D Mark III). The difference between 8 and 12 bits is significant when making certain adjustments - especially contrast/levels/curves. So, the 14-bit files should be a nice upgraded feature. But, as I write this, I'm still looking for a comparison to clearly show this advantage to you. The change seems to be in subtly better image quality. Keep in mind that .JPG files are only 8-bit, they will not retain the extra color information. An obvious 14-bit change is the increased file size - about 40% larger than an XTi file. An XTi/400D RAW image that weighs in at 10 MB would become a 14 MB file on the 40D. The same 30D image is about 8 MB in size. The improved microlens design likely contributes heavily to the reduced noise in images from this sensor, but it is also likely the reason for the 40D's slightly improved vignetting performance over the 30D. You can use the Lens Vignetting Comparison Tool to compare the 40D to the 30D. First seen on the 1D Mark III and now found on the 40D is HTP (Highlight Tone Priority) which is designed to prevent blown (RGB=255,255,255) highlights. An ISO value of at least 200 is required for this setting. The feature works. It should primarily be used when the scene to be captured has some very bright highlights in it along with dark colors. A black tux beside a white wedding dress is the classic illustration. But, I don't recommend using it unless necessary as I prefer the contrast/tone curve of a standard shot better. Shadow noise will be slightly higher in an HTP image. A brand new Canon feature on the 40D is Auto ISO - found by selecting the ISO value below 100. I got excited when I first heard of this feature - I thought it might be the ISO Priority mode I've been hoping for. Alas, it is not quite what I was looking for. The function of Auto ISO varies depending on the shooting mode that is selected - See page 60 in the manual (link below) for the complete details. It looks very useful in the non-creative modes (including the green square point and shoot mode), but is weighted strongly to ISO 400 in the creative modes. Far to strongly for me personally. Overall, the Canon EOS 40D's image quality is excellent. I'm pleased. In the above spec comparison, we can see that, in addition to features I already mentioned, the 40D has a higher magnification viewfinder than the 30D and 20D. While the viewfinder continues to show 95% of the final image framing, the image appears larger in the viewfinder. The key point being that the viewfinder has been enlarged to accommodate this. It is brighter and sharper - eyeglass wearers will find it easier to use as well. The improvement is noticeable - I like it. The ISO setting (100-1600 in 1/3 stop increments as well as H/3200 if enabled) is visible in there as well. The 40D is also the first DSLR in its class to accept interchangeable focusing screens including the EF-D grid. I use a grid focusing screen in my Canon EOS-1DS Mark II - it helps me keep horizons level (I seem to have a deficiency in this skill) when I want them to be. As made obvious in the DSLR back comparison pictures above (use the mouseover links), the viewfinder is not the only physical change Canon has made in the 40D. The new 3" LCD is the in-your-face change - or should I say in-your-nose since I have trouble keeping mine off of this new LCD. I'm cleaning it much more frequently than I did the 30D's - and the 1-series bodies have more nose relief (its eyepiece extends farther out the back). The new LCD is big, bright, has good color and allows me to adequately determine image sharpness. Line up a 40D, 30D and XTi/400D with the same image being reviewed and the 40D's LCD color advantage is nearly as obvious as the size difference. I use image review on my LCD primarily for insuring that the image I made is what I wanted - this LCD is more than adequate for this purpose. The only complaint I have is that, like with the Canon EOS-1D Mark III's LCD, I can't see the borders of the brightness histogram when in bright sunlight. Canon: I request that a vertical bar be displayed on the side boundaries of the histogram - maybe you can make it red. A new use for the rear LCD is previewing your shot in Live View mode. We first saw this excellent feature on the 1D Mark III. Basically, you can preview your 40D shot just like on a typical point and shoot camera. Enable Live View (a menu option - I leave mine enabled), press the "Set" button (which raises the mirror and opens the shutter) and see the image live on the LCD. Live View focus is manual-only with one exception. During Live View, the "AF-ON" button can be pressed to enable autofocusing (the mirror temporarily lowers to make this happen). The AF point(s) selected before entering Live View is utilized. To facilitate manual focusing in Live view, a 5x and 10x zoom along with necessary panning functions are available. At these settings, critically accurate manual focusing is very easy. Two "silent" shooting modes are available in Live View. These are not truly silent, but are much quieter than a normal shot. Also available is a live histogram when "Exposure Simulation" is Enabled - The "Info" button then toggles this view on/off. Live View is best used in a tripod-based situation, but can work handheld if your DOF (Depth of Field) is deep enough to allow for the inevitable movement (think overhead shots). Another great way to use Live View: Attach a computer via the 40D's USB 2.0 port, load Canon's included EOS Utility software and take complete control of the camera via the computer. The Live View display will be on your monitor, 5x and 10x zoom is available along with panning the image, the focus can be adjusted using your mouse (switch lens AF on), shot settings can be adjusted similarly and the actual picture can be taken with another mouse click. Very nice - It works very well. Shooting information can now optionally be displayed on the rear LCD in addition to the top LCD. While it seems like a minor feature, there are some situations where this is quite useful - such as when the camera is mounted high on a tripod (now you don't need a ladder to see the top LCD). The big 3" LCD has displaced the left-side buttons. The menu button went up, the rest went down. Functionally, it just takes a little getting used to if the 30D-positioned controls are what you are familiar with. The power switch is slightly redesigned and more-recessed. I personally find it a little harder to use, but the change is insignificant. Moving up we find a new button labeled "AF-ON". This button allows activation of AF with the thumb - the shutter release half-press activated AF can be turned off. Many photographers prefer the thumb-activated AF method. One advantage is that it eliminates need to hold shutter half-pressed while recomposing the frame. I personally haven't seen the light with this methodology yet, but there's always hope - and the camera gives us freedom to be different. And moving up from there ... I thought I did something wrong when I took the comparison pics - and was preparing to re-take them. Fortunately I checked the cameras first. Along with the unexpected size difference (based on Canon's specs - more later), the 40D's top LCD is sloped from front to back. This makes it easier to read in a more natural camera position. And on up ... The 40D has a built-in flash like its predecessors. The notable change on my particular model is that I have to press directly over the latch on the right side while closing it - otherwise it pops open again. There must be enough flex to prevent the latch from catching otherwise. This is apparently an anomaly on my 40D body as others are saying their models are not as particular. The built-in pop-up flash is useful especially as fill flash. If your needs are for direct lighting, a shoe-mounted flash (bounced) is usually a superior option. 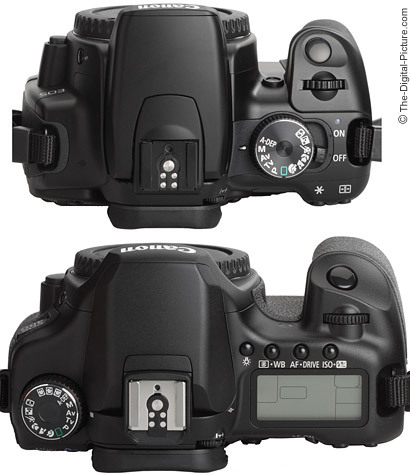 And to that end, the 40D sports Canon's new hot shoe first seen on the 1D Mark III (see the top-view pic below). I no longer expect to see the typical hot shoe paint wear caused by installing/removing flashes. This design also matches the new flash foot design first introduced on the Canon Speedlite 580EX II. Flash settings can now be controlled directly from the 40D's menu (when the internal or a compatible external flash is used - only the 580EX II at this point). 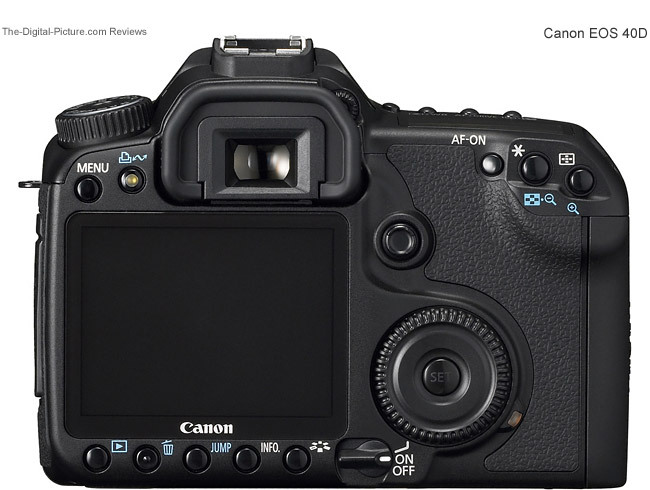 The Canon 40D has inherited the 1D Mark III's tabbed menu layout - I expect we will continue to see this layout in Canon's future models. Even the custom functions are split into 4 groups like the 1D III - though there are not nearly as many options in each of these C.Fn groups (24 total). I personally like the new menu design a lot - and standardizing will make it easier to switch between the different camera models. What I especially like is the "My Menu" option that allows up to 6 menu and custom function options to be placed on one menu tab for quick access. Included on my "My Menu" are Format, Mirror Lockup and ... Clean Sensor. My 40D arrived with a clean sensor out of the box. While this should not be remarkable, this experience is not typical - and the new XTi/400D I bought to compare with the 40D came with a VERY dirty sensor. But, thanks to the 40D's self-cleaning sensor feature (I'm sure), I have not needed to perform a sensor cleaning yet. This is after many, many lens changes (including many outside) and thousands of frames taken. I'm impressed so far, but not fully convinced that perfection has yet been achieved. Canon indicated to me that this is the same self-cleaning system found on the XTi/400D. I found that unit to be helpful, but not perfect. So if the information I received is correct and since I change lenses a lot, I expect sensor cleaning to remain one of my often-used menu options. 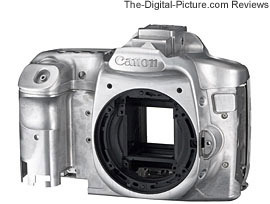 Canon's 40D White Paper references the 40D's sensor cleaning system to that of the 1D Mark III's with some changes. I'm very pleased with my sensor cleanliness so far - but ever skeptical. Canon's specifications for the 40D are listed as 5.7 x 4.2 x 2.9" (145.5 x 107.8 x 73.5mm) - practically identical to the 30D, but my dial calipers say it is .2" (5mm) higher. Side by side, it is obvious that the 40D is slightly taller though the difference is not of significance. I haven't noticed the 40D's slight weight gain over the 30D when switching between these two bodies. What I did notice was the improved shape of the 40D's grip - primarily a deeper cut finger groove. I like this change a lot - it fits my hand better and give me a more-sure grip. You can see a good part of the 40D's weight in the photo above. That is a tough stainless steel and magnesium alloy frame. It gives the 40D a very solid feel and good strength/rigidity to go with it. New to the 40D is partial weather sealing. Basically, the battery and memory card (CompactFlash) doors have some modest sealing. This is not the complete sealing that Canon's 1-Series cameras receive. You will want to avoid getting the 40D wet. You are looking at an XTi/400D over a 40D in the comparison picture above. 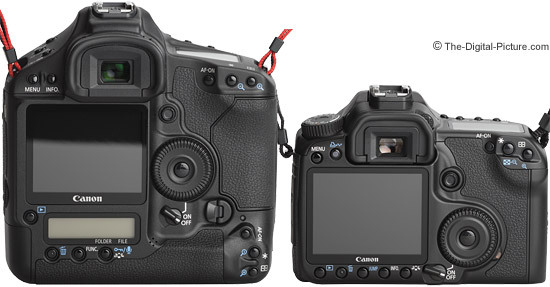 Take note of the large number of options available on the 40D's shooting mode dial. Fifteen options ranging from the green square (the camera takes care of all settings - point & shoot mode) to fully manual mode (the mode I shoot in if light conditions are constant) are available. The three new ones are labeled C1, C2 and C3. Setup the camera for a shooting situation you want to be able to quickly return to, and assign this setup to one of the C modes via a menu option. When you need to recall these settings, simply turn the mode dial to the selected C mode. One thing to remember is that any change you make to the camera settings while in one of the C modes will be reset if the camera is powered off OR goes into sleep mode. This camera is fast - and its buffer is deep. I am reaching 20 RAW shots in 6.5 frames per second drive mode in certain tests (listen to the burst below) - with about 1 additional shot per second once the buffer is filled (using a SanDisk 16 GB Extreme III CF Card). Canon is using dual motors in the 40D - one operates the mirror and one resets the shutter. The .59ms shutter lag is definitely short enough to catch a sports action moment - and nearly as short as the 1-Series shutter lag. 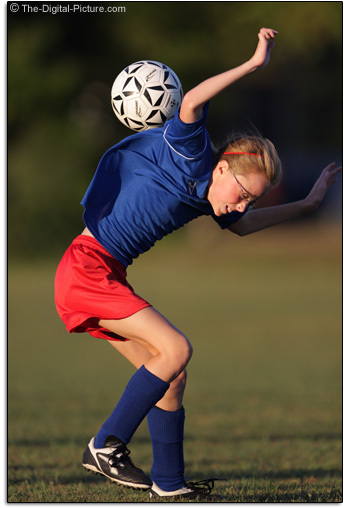 The shot above came from a late day soccer game I was shooting with the 40D in AI Servo AF mode and 6.5 fps drive mode. A Canon EF 400mm f/2.8 L IS USM Lens was used. This shot was the first in a burst - the 40D's quick shutter response let me capture the humorous shot of a soccer ball immediately before it hit the soccer player. A short shutter lag can make the difference between capturing a great shot and just an ordinary one. You are at least considering shooting with a DSLR, so I'm sure ordinary is not what you are looking for. An additional drive mode - 2-Sec Self Timer - is very welcomed. If tripod-mounted shots are not time-critical, I will often use this drive mode instead of attaching a remote switch. Yes, I am too impatient to wait the additional 8 seconds (though when mirror lockup was used, the 30D automatically changed to 2 seconds). Autofocus is one of the most important camera functions for most people - OOF (Out of Focus) shots are usually of no value regardless of their image quality. While some have mastered manual focus, I find that the camera is usually better than me at this job (OK - usually MUCH better). So, it is welcomed news when an improved AF system is introduced. From the Canon USA Press Release: "While the EOS 40D SLR maintains the nine-point wide area AF coverage first introduced on the EOS 20D camera, Canon has made significant improvements to its speed, precision and functionality, minimizing subject recognition problems in the process. The EOS 40D camera's completely redesigned nine-point AF sensor provides cross-type AF measurement at all nine focusing points for maximum apertures up to f/5.6, and for the first time in any EOS camera, the central AF point offers enhanced precision for both vertical and horizontal subject contrast when using EF or EF-S lenses featuring maximum apertures of f/2.8 or faster. AF calculation speed with the EOS 40D camera is 30 percent faster than the EOS 30D model." That is great stuff. Many people are indicating a noticeable difference in this new AF system - especially in low light/low contrast situations. I am finding this difference hard to detect when comparing the 40D and 30D side-by-side - I'm not seeing a big difference even in low light. I've tried these two bodies with a variety of lenses in a variety of light and subject contrast levels. The 30D was fast focusing, and the 40D appears at least as fast. I am getting a good AF hit rate from the 40D - even at 6.5 fps in AI Servo mode while shooting sports - some improvement is noticeable here. Overall, the 40D's AF performs very respectably in the many varied situations I've put it up against. Bringing our ears into the equation, following are some MP3 files containing the 40D's shutter sounds. To my ears, the 40D is noticeably quieter than the 30D (very nice), but the sound is a bit buzzier (not quite as classy). There seems to be a vibration noise and feel during the process. The burst sequence was shot at max shutter speed - 1/8000 sec. Obviously, a slow shutter speed may not be able to achieve this frame rate (1/2 sec for example). Note: I'm not satisfied with the db levels in the burst comparison below - I don't feel it adequately shows the 40D as being quieter than the 30D. The microphone was identically positioned behind each camera's rear LCD in each of the recordings - the three recordings were trimmed and combined. What is apparent is the frame rate and buffer depth difference. In the comparison, each camera was fired at its fastest frame rate and fastest shutter speed (1/4000 for the XTi) with a wide open aperture until the buffer were filled. If you are shooting in portrait orientation, especially if you are shooting in this orientation for a long period of time, an accessory portrait/vertical grip is a great asset. It gives you a much more comfortable and stable "grip" on the camera body. There are several grips available for the 40D (they attach to the bottom of the camera as shown above). The first is the battery grip made for the 20D/30D - the Canon BG-E2 (now discontinued). The second is the new at this time Canon BG-E2N. This grip surprisingly does not include the "AF-ON" button, but does add some weather sealing. The third option is the new Wireless Transmitter WFT-E3A. The WFT-E3A "Permits wireless transfer and back-up, as well as wireless remote control of the camera in Live View mode. It can also be connected to various GPS receivers or Hi-Speed USB 2.0 external storage devices such as convenient flash drives or high-capacity hard drives with much larger storage capacity than the memory cards in the camera for instant back-up as images are captured." It also provides an "AF-ON" button and has some weather sealing. The 40D continues to use same battery as its predecessors - the Canon BP-511A Battery. I like these batteries - they are relatively small (it's easy to carry a spare or two) and they deliver a very sufficiently large number of shots. The compact size of the BP-511A's charger is especially convenient when traveling. I usually keep careful track of my battery use when I get a new camera. Unfortunately, I lost my 40D shot count due to sharing flash cards in multiple cameras (this can change the camera's image number). I estimate the first battery to have delivered well over 1,000 shots. Canon rates the battery life at 1,100 shots without flash (800 with 50% flash use). Sounds right to me. Still included on the 40D is the print button. This is no big news to many of us, but what caught my attention is the ability to rotate the image +/- 10 degrees within the in-camera trim function. This is a feature not even present in DPP (Digital Photo Pro), the full-function processing software included with all of Canon's EOS Digital cameras. 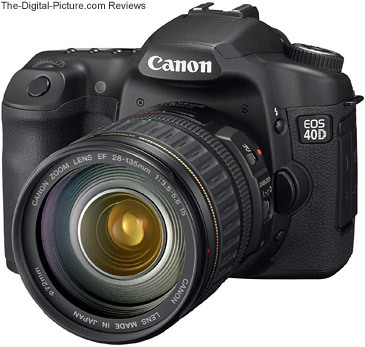 The Canon EOS 40D's feature and spec list goes on and on - it has most or all of what most people need. There is a link to Canon's 40D White Paper in the "Other Information" section below. It, along with the owner's manual, is worth reading if the 40D sounds like the camera for you. The smaller size is an advantage when carrying/packing/storing the camera. However, I much prefer the larger grip on the 40D when actually using the camera. The 40D is more sure-handling, in my opinion. 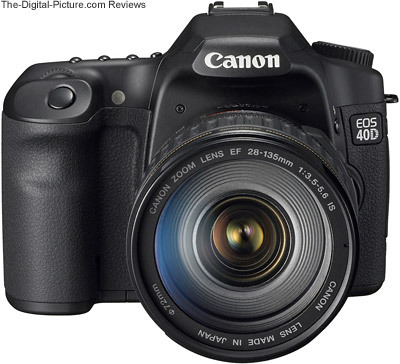 In all other features, the 40D is minimally equivalent and often the feature leader. I already talked about many of the new/upgraded features in the 40D as they relate to the EOS 30D, but the rest of this 40D-over-XTi/400D advantage list is also shared by the 30D. The much shorter shutter lag and mirror blackout along with a far faster frame rate and deeper buffer makes it much easier to capture the perfect moments with the 40D - especially action sports. The 40D's fastest shutter speed is 2x that of the XTi/400D (1/8000 vs. 1/4000 sec) and has a shutter life rating 2x that of the XTi. The 40D has a pentaprism viewfinder while the XTi utilizes a pentamirror - The 30D and 40D's viewfinders are larger. The 40D has a more advanced autofocus system than the XTi AND 30D which share the same AF technology. The 30D is still available and listed as a current model as I write this. I have not heard if (when) it will be discontinued, but it remains a good choice as well. The XTi's primary advantage over the 30D is the self-cleaning, higher resolution sensor - along with the size/weight/cost factor. I do not currently have a 5D, but I regard it to have somewhat better image quality than the 40D. It is priced that way as well. The 5D is a little larger but utilizes a very-low-noise full-frame sensor. The 5D resolution advantage will not be big in real life shots. Some people are referring to the 40D as a baby Canon EOS-1D Mark III. While the 40D shares many of the features of the 1DIII, I consider the 1-Series body to be a much better body - which is of course reflected in its cost. And once again, you must determine if the extra cost is warranted for your needs/wants. The 1-Series bodies are really awesome to use (like driving a fine sports car) - It is hard to go back after using them. While the 1DIII's resolution is similar to the 40D, the per-pixel image quality and low ISO noise yield images that are even more impressive than the 40D's. The 1D III's 45pt AF is faster, its frame rate is higher, its shutter is rated for 3x the actuations, its viewfinder is larger with a 100% view, it is weather sealed ... Of course, while the 40D makes a Rebel XTi/400D appear small, the 1D Mark III makes a 40D appear small (without a battery grip at least) (below). In the USA, the Canon EOS 40D is currently shipping in a body-only configuration as well in a kit that includes the Canon EF 28-135mm f/3.5-5.6 IS USM Lens (shown above). The kit is a great value - You get a decent image stabilized lens for an additional cost that is far less than if purchased separately. Canon continues to keep IS in its lenses as it can optimize the system for each lens - and provide a stablized viewfinder image. The 28mm wide focal length may be long for some people on this camera (but everyone will like the 135mm end). I suggest some alternative (or complementary) lenses in the General Purpose Lens Recommendations. While I'm on the subject of lenses, I'll answer another FAQ. Yes, the 40D (and XTi) can make use of the higher quality lenses available. These bodies have the highest density DSLR sensors Canon currently makes - They need quality glass to take full advantage of their capabilities. The Canon EF-S 17-55mm f/2.8 IS USM Lens is my most-frequently-recommended lens for the 1.6x bodies (I keep one mounted on my 40D for immediate use). "The 40D is a camera that will appeal to a vast range of photographers from advanced amateurs to working photojournalists and wedding photographers. All will appreciate its exceptional image quality, ease of operation, speed, modest weight and size, compatibility with the vast Canon system and very reasonable price." [Canon 40D White Paper] I agree. The 30D already sees a lot of professional use - The 40D offers enough improvements over the 30D to make an upgrade justifiable. Watch for them at the next wedding or other event you attend. And no less important will be the huge number of family memories preserved with the 40D. With its all-around good performance combined with the densest Canon DSLR sensor available, the 40D will have a large number of wildlife (especially bird) photographers as its owners. I'll personally be making the 40D part of my kit (replacing my 30D).